The pre-game cheer to greet the news that Alisson Becker would start against Napoli showed the relief Liverpool fans feel knowing Loris Karius will no longer be first-choice between the sticks at Anfield. Unfair to leave such a young goalkeeper out in the cold some might say, but try explaining that to any Liverpool fan who spent a fortune travelling to Kiev in May only for Karius to commit two howlers and hand Real Madrid a third consecutive Champions League. However, two early goals gave Liverpool the perfect start with James Milner and Georginio Wijnaldum both scoring inside the 10-minute mark. The Merseyside club caused Napoli all sorts of trouble and never looked like conceding at the same time. But it was only going to get worse for Napoli as the second-half saw Liverpool score a further three goals, this time through Mohamed Salah and substitutes Daniel Sturridge and Alberto Moreno. Following Liverpool’s superb display against Napoli, here are five observations from Dublin. The Brazil international immediately lived up to the cheers as he took his first touch in a Liverpool shirt. It resulted in a 60-yard lump up the pitch to Mohamed Salah. Then, 20 seconds later, Milner arrives on the edge of the box to score the opener. What an incredible introduction – even Virgil van Dijk couldn’t hide his awe at the man behind him. 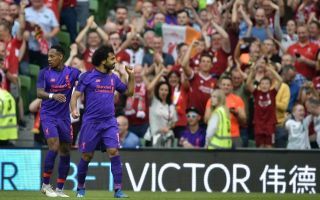 The space between Napoli’s defence and midfield gave Liverpool plenty of room, with Salah and Mane continuously quick to take advantage of a back three that were all over the place, so it was no surprise to see Liverpool 2-0 up after 10 minutes with Wijnaldum doubling their lead. If this is the sign of things to come, Jurgen Klopp has addressed a key area in this Liverpool side. Allison’s build and levels of distribution are forces to be reckoned with. The vast majority of Liverpool’s best moves in the first half involved new signing Keita. The former RB Leipzig midfielder always wanted possession of the ball with the view to take it forward. While it’s too early to predict how important he will be to Klopp this season, he left a good impression in Dublin on Saturday night. Along with fellow new recruit, Fabinho from AS Monaco, Keita offers Klopp something different. Liverpool have added strength and depth to the midfield department this summer. It’s unlikely they will miss Emre Can. Nathaniel Clyne working his way back into Klopp’s team, but can he and other fringe players aid Liverpool’s hunt for silverware? Following the birth of his son, Clyne started the game and looked comfortable at the back. Klopp’s squad will look bigger and stronger if fringe players like the England international hit the ground running when called upon once the season begins. Clyne performing should offer this Liverpool side even more options, which they need if their objective is to fight on all fronts. That ought to be an aim for a club this size and Klopp knows he needs to start winning. For instance, Liverpool have yet to win a single piece of silverware under the German manager and last year’s Champions League run will soon be forgotten. Liverpool fans are firmly behind Klopp, but surely questions need to be asked if he fails to deliver a trophy again?